I have a gnome. He used to sit in my garden, but the sun here is SO strong that his colors got completely washed out, so I gave him a fresh coat of paint and moved him to my shady potting bench. (Hijack: if you didn’t already know it, Mr. Maui Stamper is THE BEST. I couldn’t find a potting bench I liked, so he BUILT me one for my birthday a couple of years ago. I love it.) Anyway, my little gnome sits on the top shelf looking benevolently over my projects. He’s a genuine Swiss gnome; I bought him at a hardware store in Locarno in 2005 when we visited Mr. Maui Stamper’s family there. I think our hostess thought I was nuts, buying this goofy terra cotta gnome to haul all over Switzerland and Italy in my suitcase. And perhaps I was (and still may be!) But this fellow reminds me of a wonderful trip, and keeps an eye on things for me. It’s dark outside right now, but tomorrow I need to go out there and take his picture so you can see what a charming fellow he is. It’s just silly as can be, and those gnomes…well, they certainly have a personality of their own. 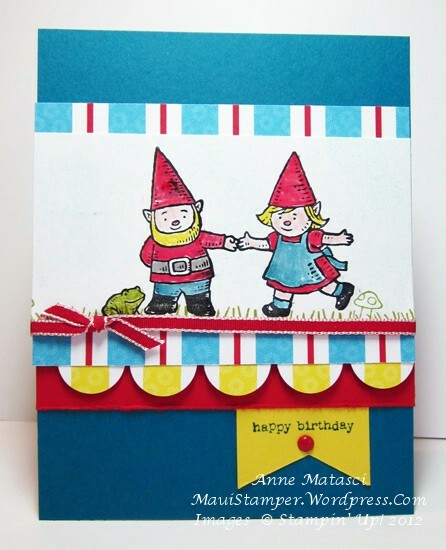 The little frog makes me laugh, and the gnomes…well, they remind me of Switzerland. So much simpler than it looks…REALLY!